The Accountability Division serves to provide all stakeholders with important information on the performance and progress of Georgia schools, districts, and the state. The division also improves communication between all Georgia public schools and stakeholders regarding federal and state education accountability initiatives. The division is also responsible for ensuring the state meets the accountability requirements of the Every Student Succeeds Act (ESSA). 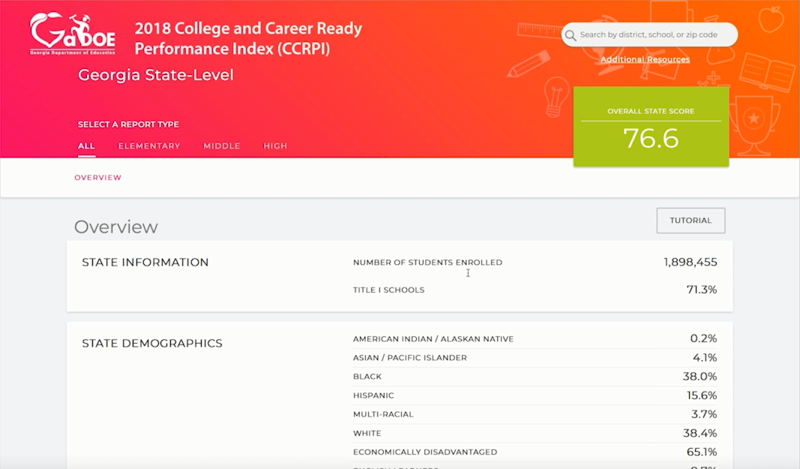 Finally, the division publishes the College and Career Ready Performance Index (CCRPI) reports. Each school system has a dedicated Accountability Specialist to serve as a liaison between the Local Education Agency (LEA) and the State Education Agency (SEA) to provide support for all areas of accountability including, but not limited to, interpretation of the reports. The CCRPI includes five main components each scored on a scale of 0 to 100: Achievement, Progress, Closing Gaps, Readiness,and Graduation Rate (high school only). These components, encompassing multiple indicators, are combined for a total CCRPI score on a scale of 0 to 100. The CCRPI also reports other information, such as the performance of student subgroups, school climate, and financial efficiency status. Note: The 2018 CCRPI uses an updated calculation approved as part of Georgia's state plan for the Every Student Succeeds Act (ESSA). 2018 scores are NOT comparable to any prior year. Any comparison, or statement that school or district's scores have "risen" or "dropped," is incorrect. Use the links on the right to access documents and resources related to CCRPI and the state’s accountability system. Educators can access resources designed to assist them with the calculation and use of CCRPI in CCRPI Resources for Educators. Information and resources prior to 2018 may be found in the Accountability Archives.